If there’s one thing we know about in the UK, it’s wet weather, and so it’s only appropriate that SealSkinz is a British company that specialises in waterproof, breathable and windproof clothing, such as these lightweight SealSkinz 100% Waterproof Thin Ankle Socks with Hydrostop. 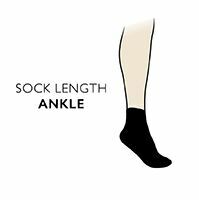 These thin ankle length socks suit a whole multitude of hot and wet climate activities, where minimal insulation and maximum breathability are required. With SealSkinz’s Stretchdry technology, these socks are not only waterproof, but also breathable, offering a stretch fit for comfort. They are merino wool lined for advanced moisture control and comfort, with elasticated cuffs and 'Hydrostop' silicone-free grippers to reduce water ingress. SealSkinz 100% Waterproof Thin Ankle Socks also have hand linked toes for smooth seams.